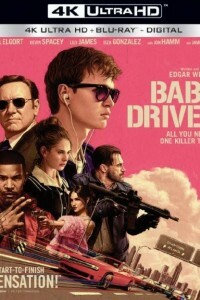 Baby (Ansel Elgort) – a talented, young getaway driver – relies on the beat of his personal soundtrack to be the best in the game. When he meets the girl of his dreams (Lily James), Baby sees a chance to ditch his criminal life and make a clean getaway. But after being coerced into working for a crime boss (Kevin Spacey), he must face the music when a doomed heist threatens his life, love and freedom. Extended/Deleted Scenes – 20 minutes of extended scenes and a few moments that were dropped from the final cut. Mozart In A Go-Kart: Ansel Drives – Ride shotgun with star Ansel Elgort as he works with the talented stunt drivers to become the ultimate getaway driver. I Need A Killer Track: The Music – Explore how the film’s phenomenal soundtrack dictated both the writing process and all aspects of production on Baby Driver. That’s My Baby: Edgar Wright – Follow Edgar Wright’s vision of Baby Driver from its inception two decades ago, to its ultimate realization on the big screen. Meet Your New Crew: Doc’s Gang – Led by powerhouse Kevin Spacey, the cast assembled to form Doc’s gang is perfectly constructed with stars like Jamie Foxx and Jon Hamm as well as up and coming talent like Eiza González and Jon Bernthal. Go behind the scenes to see this talented group at work as they bring these characters to life. Find Something Funky On There: The Choreography – With every frame of Baby Driver set to a specific beat it took precise choreography by the cast, crew and editors to create a cinematic dance like nothing that’s been done before. Hear from the choreographer and filmmakers on this groundbreaking process. Devil Behind The Wheel: The Car Chases – From closing down Atlanta’s interstates to creating eyepopping maneuvers for a variety of vehicles, witness the amazing craftsmanship and sheer determination that made the film’s incredible car chases possible. Animatics – Check out over 35 minutes of the numerous pre-vis animatics developed by Edgar Wright as part of his meticulous preparation. Ansel Elgort Audition – See firsthand the audition that proved without a doubt that Ansel Elgort was the perfect choice for Baby. Annotated Coffee Run Rehearsal – Day one of production involved one of the film’s most elaborately choreographed sequences where every movement is carefully crafted. Check out the preliminary rehearsal and see the behind the scenes movement in concert with Ansel Elgort’s on camera choreography. Hair, Make Up & Costume Tests – In this stylized montage, witness the transformation of the actors through costume, hair and make-up tests. Mint Royale – “Blue Song” Music Video – This music video directed by Edgar years ago for the band Mint Royale showcases some early inspiration for Baby Driver. Complete Storyboard Gallery – See the elaborate storyboards developed for the film in this gallery featuring storyboards for the entire film. WAM has been your source for accurate theatrical release dates, entertainment news, posters & photos, free screenings, trailers, reviews and DVD release dates since 2004. Copyright 2004-2019. WAM. All right reserved.